The usual point of an ATM is to transform a virtual representation of money — the digits of your bank account balance — into crisp, green bills you can stuff in your wallet. So when a currency is virtual by its very nature, like the controversial "cryptocurrency" Bitcoin, what does its ATM look like? Simple: It swallows cash instead of spitting it out. For a demonstration, one need only visit the Burlington-based 3D print shop Blu-Bin — one of the few businesses in Vermont that accepts Bitcoin, and now home to the state's one and only Bitcoin ATM. A digital currency distributed from peer to peer without the intervention of a central banking authority, Bitcoin doesn't lack for devout adherents. But even they acknowledge one of its major shortcomings: Few brick-and-mortar businesses accept it as payment. The great majority of transactions in Bitcoin's five-year history have taken place in virtual space, and the currency still carries a stigma from its use as the coin of the realm at online black market Silk Road. 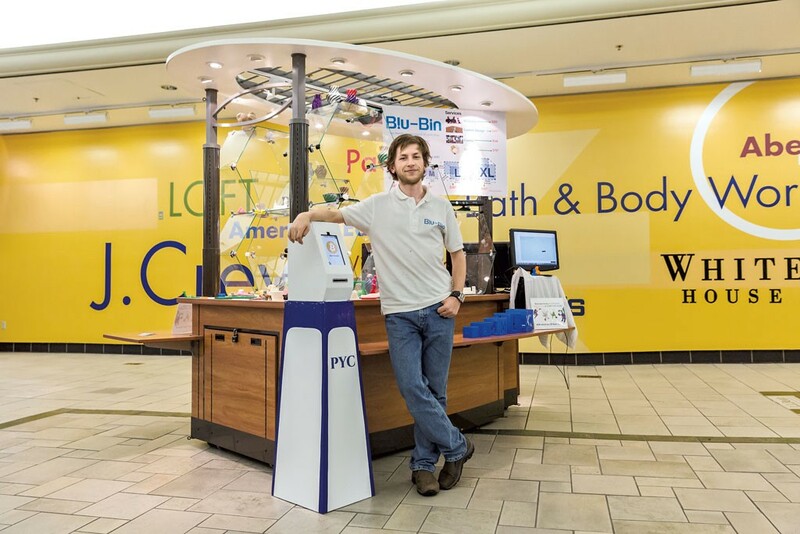 That list swelled about two weeks ago with the addition of Blu-Bin, which opened on Burlington's Church Street in September 2013; since October, the 3D print shop has occupied a stand-alone kiosk inside the Burlington Town Center. CEO Dan Riley says the move halved the company's rent outlay, but he hopes that the slim, white, chest-high device standing beside the counter represents a more significant change to Blu-Bin's bottom line. Installed on October 25 by New York-based company PYC Bitcoin, this ATM looks like the result of a curious union of the Star Wars droid R5-D4 and a traffic stanchion — and it doesn't dispense cash. Insert up to $1,000 in American currency, and the ATM will credit your digital "wallet" with the equivalent value in Bitcoin — less PYC's 8 percent profit, of which Blu-Bin receives 10 percent. In its first full week at the Blu-Bin kiosk, the machine took in $932. Emilio Pagan-Yourno, one of PYC's two cofounders, says he finds that initial take satisfactory but not thrilling. The company has installed four other Bitcoin ATMs in the Northeast: two in Manhattan; one in a bar in Manchester, N.H.; and another in a café in Albany, N.Y. That last location, says Pagan-Yourno, did about $12,000 in business in October. "But I think there are more uses for Bitcoin [in Burlington] than in Albany," he says. "This machine has the potential to do at least $12,000 a month, if not more." To demonstrate the machine, Pagan-Yourno has me download a free app called Mycelium Bitcoin Wallet to my smartphone; I use it to create my own "wallet" in less than a minute. He launches his own wallet app, then unlocks the ATM to extract a single dollar bill, which he promptly reinserts. To credit that dollar to his account, Pagan-Yourno holds up his phone to the ATM's built-in camera and displays his unique quick response (QR) code, which connects to his Bitcoin wallet. Now he can spend that Bitcoin at the Blu-Bin kiosk — by snapping a pic of the company's QR code and transferring the currency to Blu-Bin electronically. Now it's my turn. Pagan-Yourno takes a picture of my own, just-minted QR code and hits "send". In less than a second, I become the proud owner of 2.72 millibitcoins, or about 93 American cents. There's not much one can do — in Vermont or anywhere — with 2.72 millibitcoins, but Riley points out that, if I insert a few more bucks into the ATM, I'll be able to pay for a small 3D-printed item. Blu-Bin's unusual pricing scheme is well suited for customers seeking to experiment with Bitcoin: 3D-printed items are priced based on their size, with items smaller than a 2-by-2-by-2-inch cube costing $5 — er, 14.4 millibitcoins. Given that Bitcoin and 3D printing are both fairly new and potentially game-changing technologies, the partnering of PYC and Blu-Bin makes sense. Pagan-Yourno and Riley profess nearly identical mission statements: They say they want to make their respective technologies more accessible and relevant to a broader customer base. Of the two, 3D printing packs the higher wow factor, as evinced by the several curious customers who stop to stare during my brief visit to the kiosk. Bitcoin's complexity, volatility, invisibility and tarnished rep give PYC a steeper hill to climb. Pagan-Yourno says he remains optimistic. Just 22 and nearly done with his degree at Marist College in Poughkeepsie, N.Y., he has an obvious passion for Bitcoin. Pagan-Yourno and partner Julio Enrique Cabrera founded PYC with the goal of "getting people to purchase Bitcoin easily," he says. "It's pretty difficult to do that right now." He plans to double the number of PYC ATMs before year's end, and hopes to have a total of 20 installed within the next 12 months. How much is Bitcoin worth, anyway? According to the Bitcoin-tracker website coindesk.com, the value of a single Bitcoin escalated dizzyingly at the end of 2013, reaching almost $1,150 on December 4. Since then, events such as the dissolution of Mt. Gox, the largest Bitcoin exchange, have rattled even the cryptocurrency faithful; Bitcoin's present value is about $370. That valuation may reflect a new stability. Bitcoin's overall stature has been bolstered by the support of such fiduciary titans as Ben Bernanke, who said in 2013, during his tenure as Federal Reserve chairman, that the currency "may hold long-term promise." Pagan-Yourno believes that Bitcoin's historical volatility is due in part to undisciplined and often unscrupulous trading. The currency appeals to "don't tread on me" types who don't trust banks or governments to regulate their money — an attitude that has turned online trading into a messy free-for-all. Pagan-Yourno believes some regulation is vital. He's about to publish a white paper on the need for supervised trading "gateways." In his plan, open competition between exchanges would encourage fair practices that allow for consumer choice — much as banks attract customers by adjusting their interest rates. That's the bigger battle. For the short term, the young entrepreneur plans to make improvements to the ATMs themselves. The first order of business is the elimination of the $1,000 ceiling on transactions. More crucial is a software redesign that will make the ATMs more user friendly. Pagan-Yourno calls the current interface (designed by a company called Skyhook) "something an engineer would think of," noting that its bug-riddled code offers no tutorials for the new users that the company hopes to attract. When the new software is ready, PYC will install it on the Android tablets that are the digital brains of the ATMs. Once that's done, passersby will be greeted by a display that reads, "Want Bitcoin?" Such planned improvements to the ATM's user interface, Pagan-Yourno and Riley agree, will attract new customers to Bitcoin in general and to Blu-Bin specifically. Riley credits the new ATM with a small bump in his company's business. But he acknowledges that, in general, Bitcoin users are not the kind to frequent the mall; some have even told him, he says, that they wouldn't have ventured into the Burlington Town Center for any other reason. One such customer is Matt Cropp, a Bitcoin enthusiast and active member of Burlington's "community hackerspace," Laboratory B. Cropp describes how, low on cash but wanting a custom protector for his new Nexus 5 smartphone, he downloaded an open-source schematic for a 3D-printed case. Working with Riley, he added the Lab B logo to the design, printed the case and paid the bill with $50 worth of Bitcoin (about 143 millibitcoins). "I had some Bitcoin on my phone and was excited to go to a maker space that's accepting it now," Cropp says. Though he paid with his own digital currency, he says part of the draw was the opportunity to check out Blu-Bin's ATM, which impressed him with its ease of use. Customers such as Cropp, well versed in the ways of cryptocurrency, are the exception. For the moment, though, Riley says he's happy to cater to early adopters. He's also eager to expand his business, and hopes to open Blu-Bin locations in Brattleboro, Manchester, White River Junction and possibly Poultney, the home of his alma mater, Green Mountain College. He'll install PYC's ATMs, he says confidently, at any future locations. If the device catches on, it could boost the local profiles of both businesses. Riley says he's encouraged by the many curious glances he gets from patrons at the nearby Starbucks. Will there come a day when you can buy your venti latte with Bitcoin? "The whole idea" of the ATMs, Pagan-Yourno says, "is to bring [Bitcoin] to everyone. It's not about just the Libertarians or the super-fanatics. It's for you; it's for the person who hasn't even heard of Bitcoin." The original print version of this article was headlined "Bit by Bit"